One of the great crooners of the post-war era, Red Foley helped build a crucial bridge between the country music of the mountains and the Nashville Sound of the sixties. Born Clyde Foley in 1910, his hair color earned him the nickname Red. His professional career was launched by a talent show win at age 17. As a freshman in college, he was discovered by a talent scout and invited to join the house band of the National Barn Dance. He released his first recordings in the mid-thirties, and by the end of that decade, he was the first country artist to host a nationally broadcast radio show, which he co-hosted with Red Skelton. During this period, Foley wrote “Ol’ Shep”, which would be recorded by many major artists, including Elvis Presley and Hank Snow. 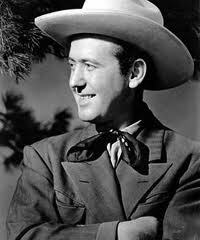 Beginning in 1946, he emceed the Prince Albert Show, which broadcast a portion of the Grand Ole Opry’s show every week. His profile was raised even more significantly by the Ozark Jubilee, the fifties network television show that Foley hosted for many years. His television fame helped bring his smooth style of country music to a very broad audience, though Foley never actively pursued the pop music scene. Indeed, his country records decreased in popularity as the Nashville Sound took root, though his gospel recordings remained quite popular. The sixties found him guesting on sitcoms and talk shows, while he continued to tour the world as part of the Grand Ole Opry cast. In 1967, Foley was inducted into the Country Music Hall of Fame, an achievement that was sadly overshadowed one year later by his untimely death at age 58. Today, Foley’s name is not as recognizable as many of his contemporaries, but it takes only one listen to his signature songs to immediately grasp the impact he had on the development of contemporary country music. Red was in that no man’s land between the Nashville Sound and traditional hillbilly. Many viewed him as too smooth and too slick whereas I always viewed him as a simply a very fine singer.